We are all beginning to get those invitations for holiday parties, so your time is running out for finding that perfect dish! I always like to impress people with a delicious, homemade appetizer. If you are still struggling with what to bring I made a list of my favorites that are sure to be a hit! Asparagus Tart – Who can resist delicious melted cheese and asparagus on a flaky pastry? Cut this deliciousness into bite size pieces and it is sure to be a party favorite! Or if you are vegan try our Vegan Asparagus Tart with White Bean Pesto. Baked Zucchini– This is a healthier option, but will still have people coming back for seconds! It can be served with ranch or marinara sauce. Veggie Quinoa – Another delectable, healthy choice that is also vegan friendly and gluten-free! Mini Pumpkin Pies – Still need to get your pumpkin craving in? Make sure to bake plenty of these, I have a feeling they will be a hit! 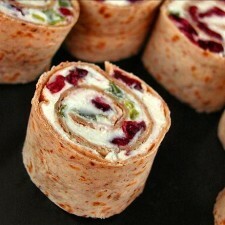 Cranberry Pinwheel Sandwiches – My mouth waters thinking of the delicious mixture of cranberries, feta and cream cheese. The perfect holiday treat! What are some of your favorite appetizers to make for the holidays? Share them with us, we love hearing about all the delicious foods our fans make!